Rajinikanth Film Review From BloodStone. BloodStone Movie. Rajini Film BloodStone. Rajinikanth BloodStone movie. www.rajinikanth.com. In 12th Century India a huge ruby was bestowed with the power of good and the curse of evil by the spilled blood of princess Lafla. In the 18th Century the British stole it away. 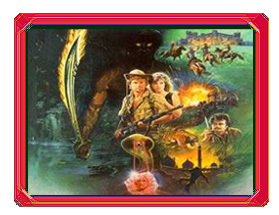 In today's India, smalltime crook Paul Lorre steals the stone back, but while attempting delivery to international fence Ludwig Van Hoeven, realizes the authorities are onto to him and slips the priceless gem into the baggage of the unsuspecting Sandy (Brett Stimely) and Stephanie McVey (Anna Nicholas). Arrested on arrival at Madras by the very Clouseau- like Inspector Ramesh, Lorre manages to indicate the American couple and their streetwise taxi driver Shyam Sabu (Rajni Kanth) to Van Hoevan's thugs. Sabu realizes that he is being followed, but does not see the huge ruby fall into a crevice inside his trunk while unloading Sandy and Stephanie at their hotel. Soon Sandy and Sabu are both in action: Sandy in a brutal fight with two thieves ransacking his room; and Sabu in a life-or-death car chase and shootout.Stephanie gets kidnapped by Van Hoeven's thugs.Van Hoeven contacts Sandy: Stephanie for the gem at the waterfalls on the road to Bangalore. Without the ruby, Sandy has no option but the police, but Sabu produces the stone igniting a vicious fight between the two equally matched men, ending in a second agreement. Sandy will pay well, but the ruby is his to exchange for Stephanie's life. They prepare for conflict, Sabu letting his heathen friends know their help may be needed. At every corner the bungling Ramesh is attempting to keep up with the furious pace, always managing somehow to fail. Sandy and Sabu are ambushed exiting the rain forests but survive the shootout and capture two of Van Hoeven's men, learning the lone secret passage before tossing them over the waterfalls.